This boxed Guinness gift set includes a gel writing pen along with a combination bottle opener key ring. Presented with the 250th Anniversary reflective sticker on the front. 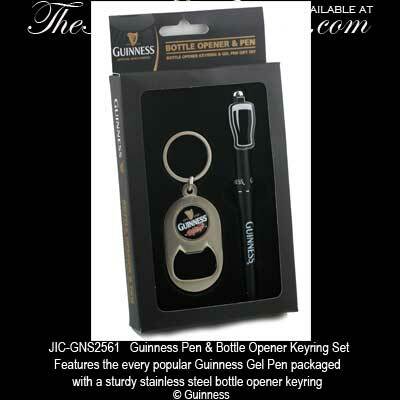 This Guinness set features a writing pen along with a key ring that are handsomely packaged in a branded gift box. The Guinness key ring is stainless steel and it features a built in bottle opener while the pen is enhanced with a classic pint design. This Irish accessory is just one of the many Guinness gifts that are available at The Irish Gift House.